We used to go here to use the room upstairs regularly for meetings. The staff were always accomodating but the landlord was never friendly, helpful or accomodating. I don't think I'll ever go back. I rated it a 4 because the staff deserve something! I found this pub to be a little odd. It has a regulation bar but as davewat says below all the furniture looks like it belongs in a cafe and one from the 1970s at that. In the early evening the lighting was very low particularly at the front of the pub and there was a small candle on each table. Ales on offer Landlord and Pride with one clip turned round. Weird environment means there is no reason to choose this pub over some of the better offerings nearby like the Windmill or Iron Duke. Visited this place on a busy friday night. The staff we helpful and i quite liked the unusual decor, though my pint of TT wasn't that good. It seemed from posters and newsletter that manager was trying hard and i would give it another go in the future. Nice pub, not too far from the hustle and bustle of Oxford Street. Looks like a traditional pub from outside but interior is a mix of pub and cafe furniture which gives it a slightly confused feel. Pleasant staff and decent pint of Landlord at reasonable price for this part of town. 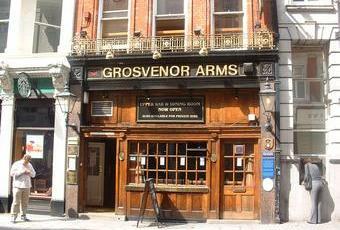 Wandered here from the Iron Duke around the corner only to find that the Grosvenor also closes on Sat evenings. It was not my lucky night.